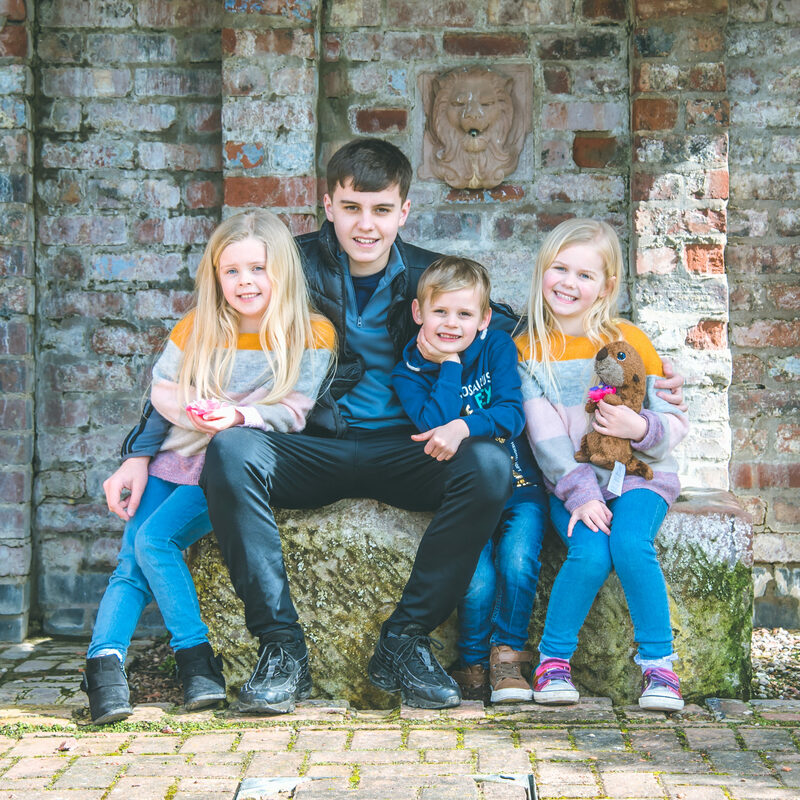 With four children, one of whom we co-parent with my ex husband, finding quality time together as a six can be tough. Although we’ve had some amazing hotel stays and holidays over the last few years, the dates don’t always coincide with the weekends we have Lewis, or with the restraints of Gaz’s job, and so often we go away just the five of us, or the four of us, which is lovely but never quite the same. 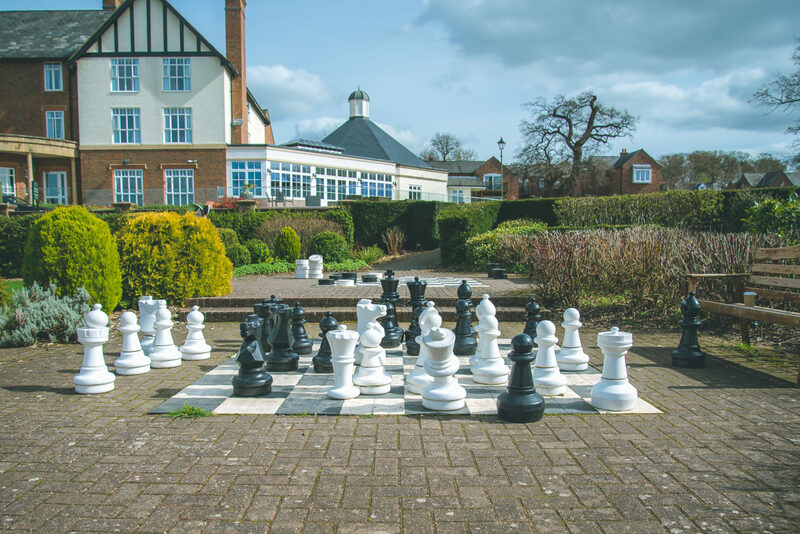 So when Carden Park Hotel & Spa invited us for a weekend break for all six of us, it goes without saying that we jumped at the chance. 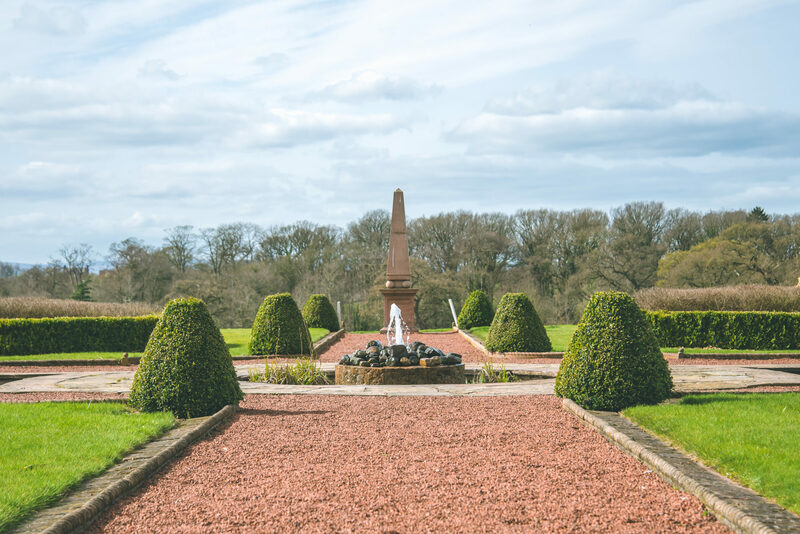 Carden Park Hotel & Spa is a four star luxury hotel in Cheshire complete with an AA Rosette awarded restaurant, two championship golf courses and an award winning spa. 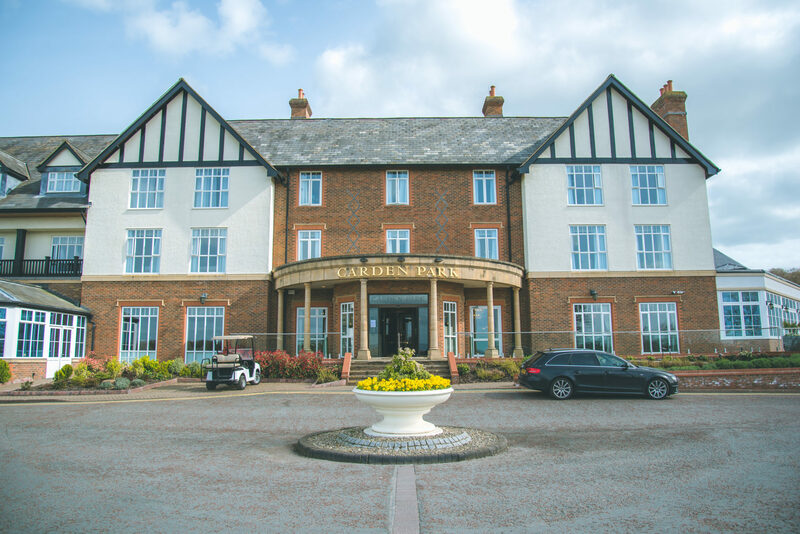 Set in 1000 acres of Cheshire countryside, just 20 minutes from Chester city centre, the hotel is utterly beautiful and as we drove up the long and winding path to the hotel it really did feel as though we were leaving the stresses of daily life behind us for the weekend. 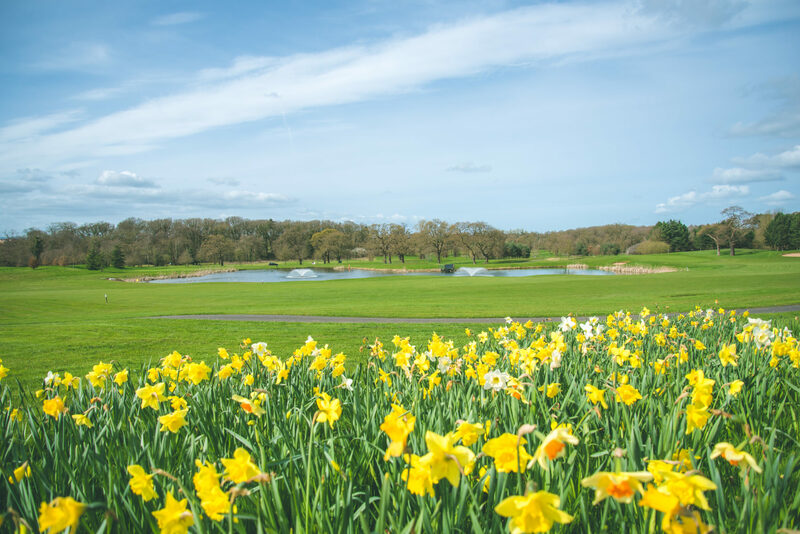 The hotel itself is huge with 198 bedrooms, many offering stunning views across the Nicklaus golf course and countryside. As we stepped into the entrance of the hotel it was instantly impressive, stylishly designed, and it may sound like a strange observation but it smelled amazing!! We were given adjoining rooms on the first floor which was perfect for the six of us. It meant that Gaz, Harry and I could sleep in one room and Lewis and the girls would sleep in the next. It also gave us lots of space to spread out and make ourselves at home, something which is really important as a larger family so we aren’t on top of each other the entire time. 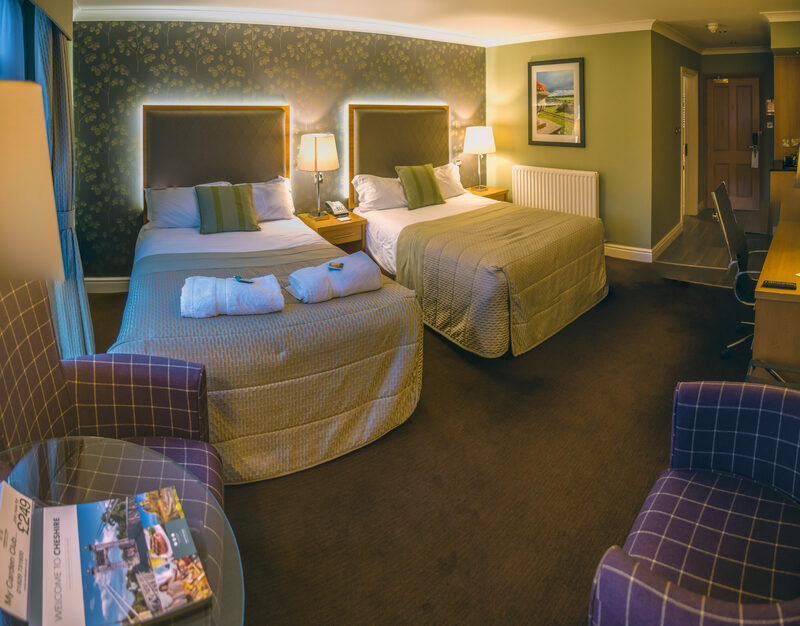 The rooms were beautiful, with our room designed in luxurious purples and the adjoining one in a calming sage green decor. 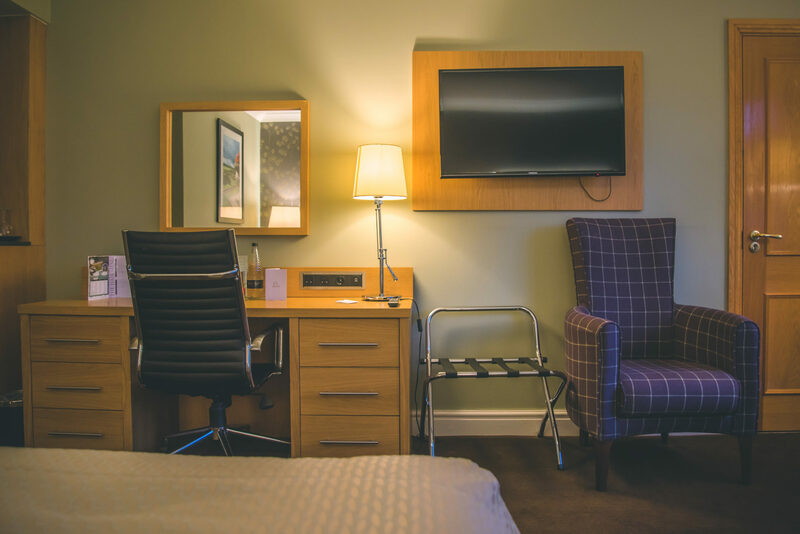 Each room had a seating area, a desk area with a large flat screen TV, ample wardrobe space, mini fridge, and tea and coffee facilities. I loved that there was water chilling in the fridge, fresh apples, and even biscuits which were a big hit with the kids! 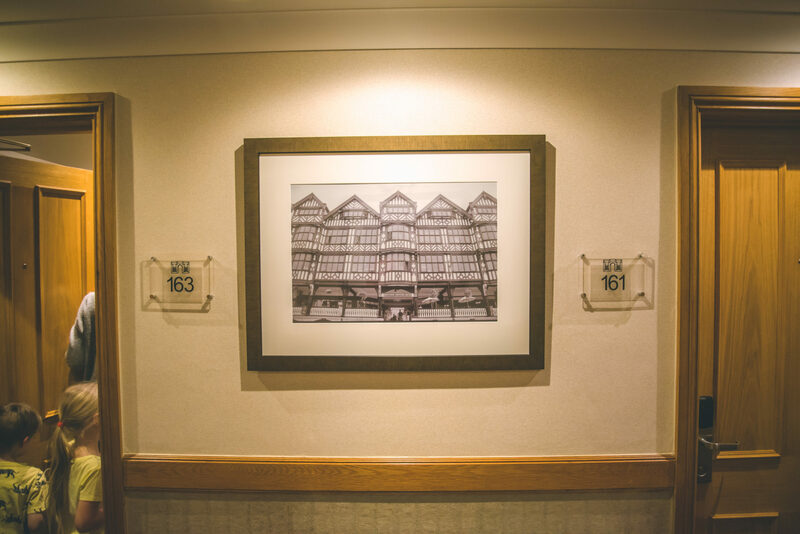 I always think it’s the small details which really make the difference and make a hotel stand out above others. 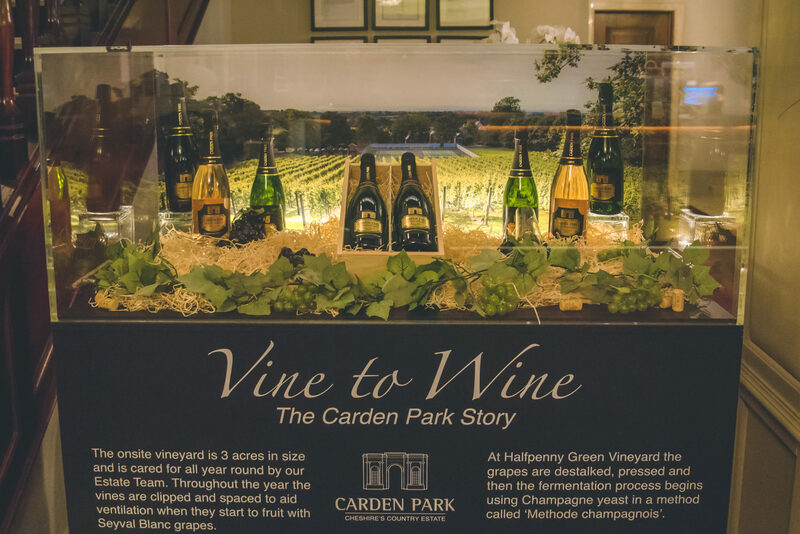 It was clear at first glance that Carden Park is a hotel that doesn’t cut corners and I love that feel of luxury about it. 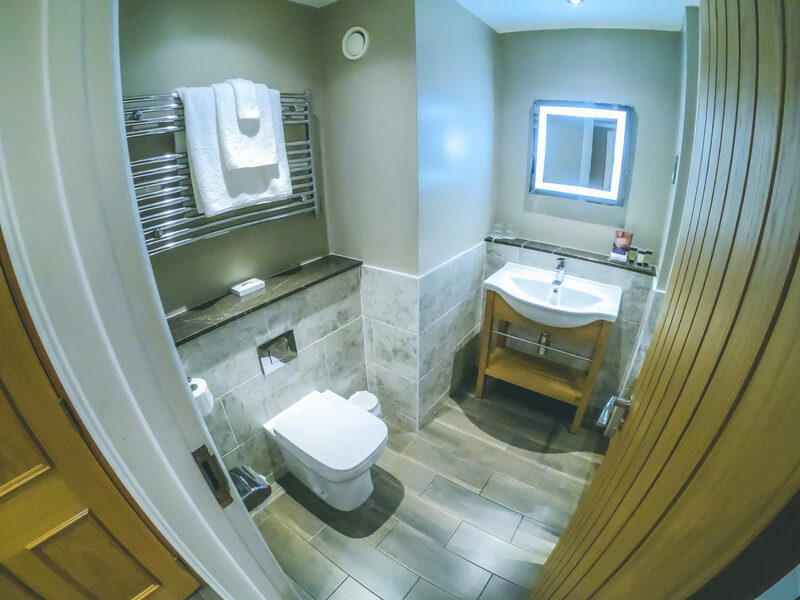 Both rooms had a stunning en-suite with both a shower and bath which I think is so important when staying in a hotel with small children. My girls hate showers and there is always a melt down when it comes to washing their hair in one, so I always breathe a sigh of relief to see a proper bath as well as a shower too. 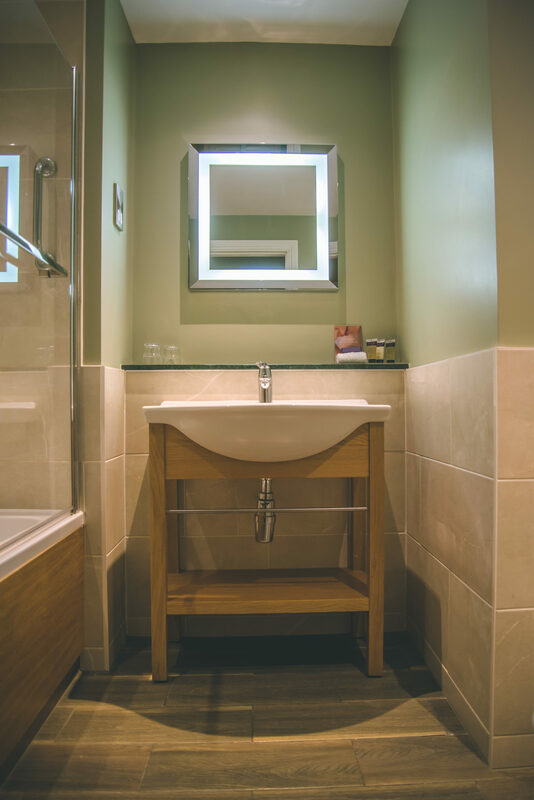 Each bathroom had a great range of toiletries which left our skin and hair feeling amazing. 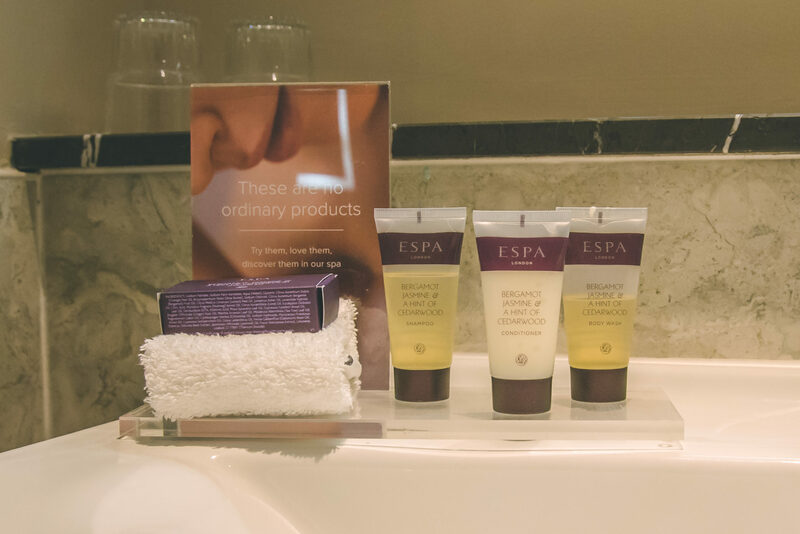 I loved that the ESPA products are used throughout the hotel as well as in the spa, and it was lovely to see these high end products in the rooms as an added touch of luxury. With arriving later on the Friday we were all ready to eat and luckily had been booked into the hotel restaurant that evening. The restaurant is gorgeous and despite our initial reservations that “This place might be a bit too posh for us!”, we were made to feel right at home. 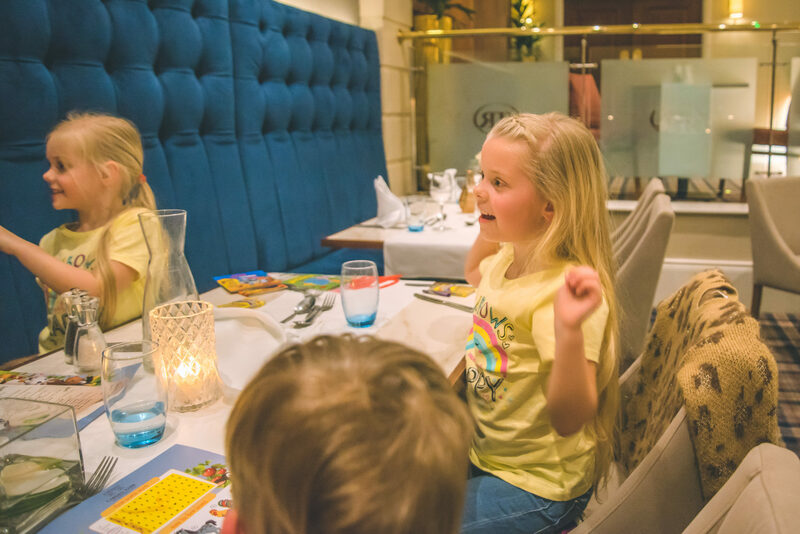 Our waiter could not have been any friendlier or more helpful and as he handed out the menus and took our drinks order he interacted with the children and told us about his own family too. On a dinner bed and breakfast basis there is a set menu at the hotel which is utterly delicious. 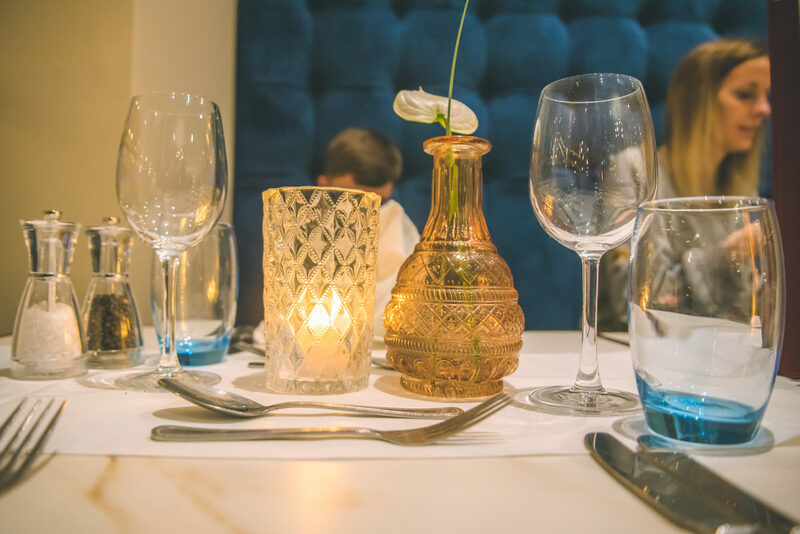 With a wide choice of starters, mains, and desserts, and a number of subsidies should you wish to pay a little extra, we really struggled to choose just one dish! 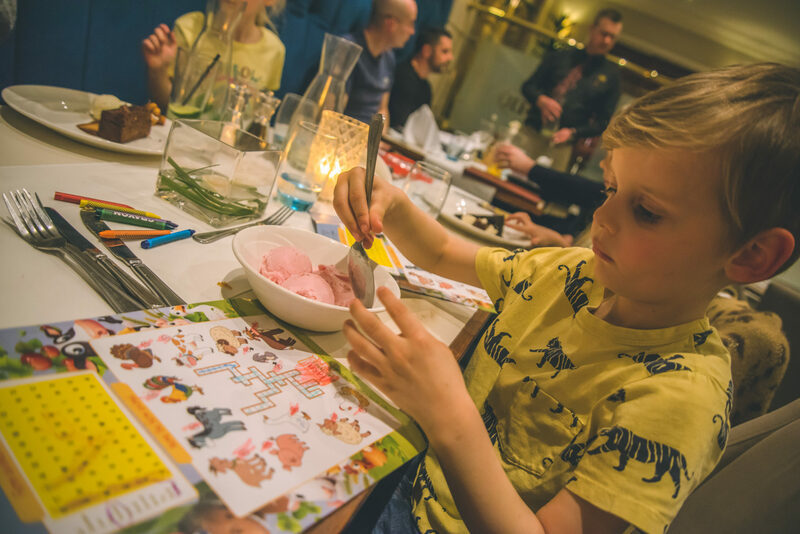 The children’s menu was by far the best children’s menu I have ever come across, and we have eaten at a lot of restaurants over the years. The choice was so varied and it was nice to see some healthier options on there instead of the standard nuggets and chips. 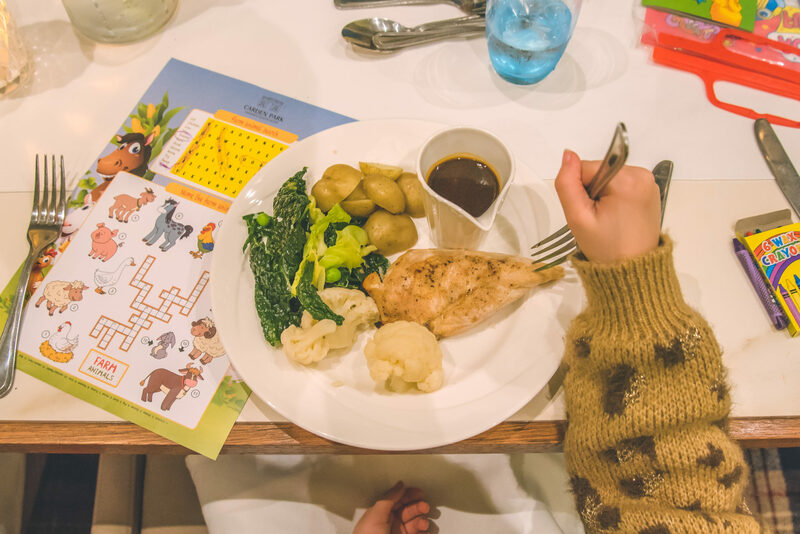 Whilst we waited for our starters to come out the children were each given an activity pack with crayons, puzzles, and colouring books. 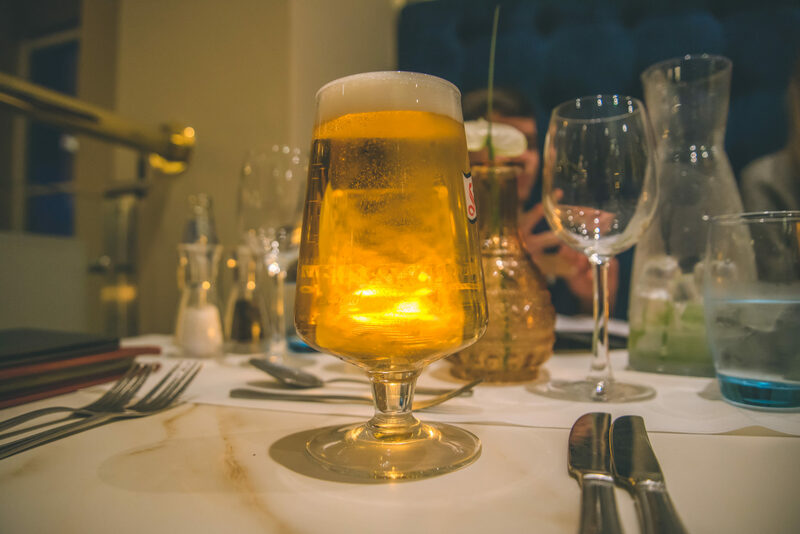 It was lovely just to be able to sit back and relax, enjoy a drink, and chat with Gaz and Lewis, something we don’t often get the chance to do when out for a meal with the three of them! Our starters arrived in no time and they were all really well presented. The children all went for cheesy garlic bread which doesn’t surprise me at all. They soon tucked in and going by the rate they ate it, it’s safe to say they really enjoyed it! 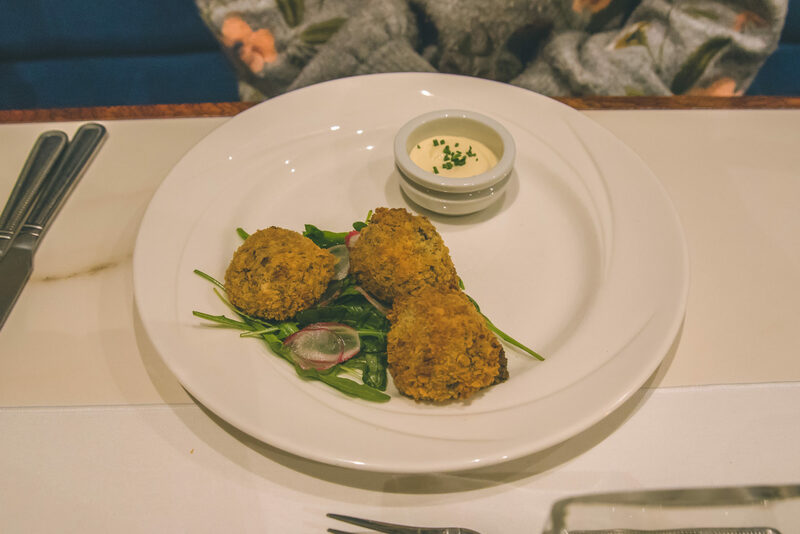 I went for the wild mushroom aracini with a blue cheese dip, something I have never tried before but it was utterly delicious. 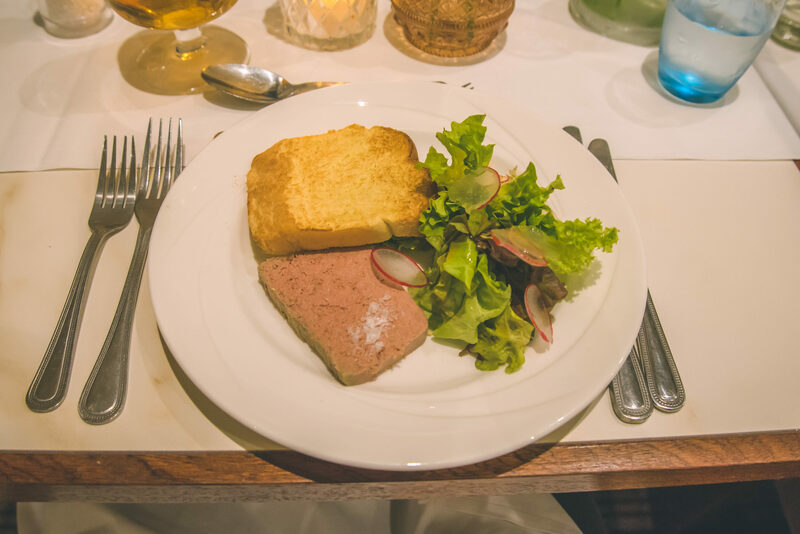 Gaz and Lewis both chose the duck liver pate and said that it was one of the best they’ve ever had. For our main courses Gaz went for the rib eye steak, I had the Spatchcock chicken, and Lewis chose the steak burger. 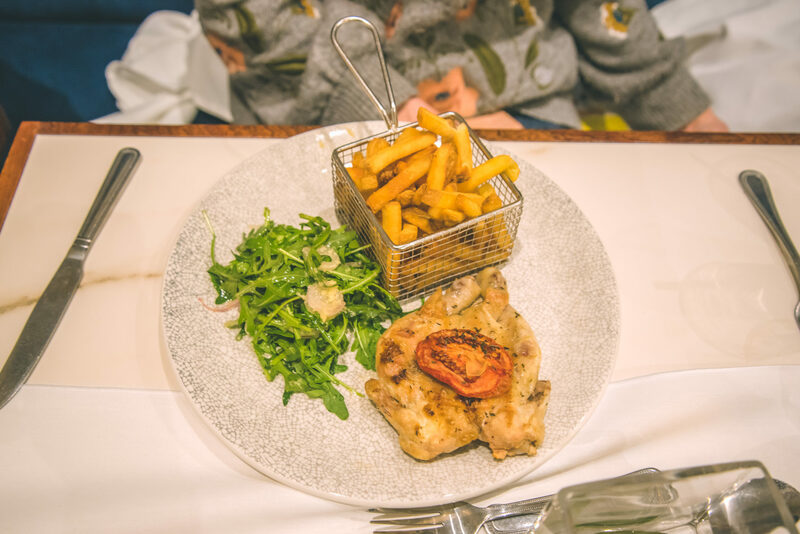 All of our meals came with their very own little fryer of chips which I loved, and side portions of salad or vegetables. 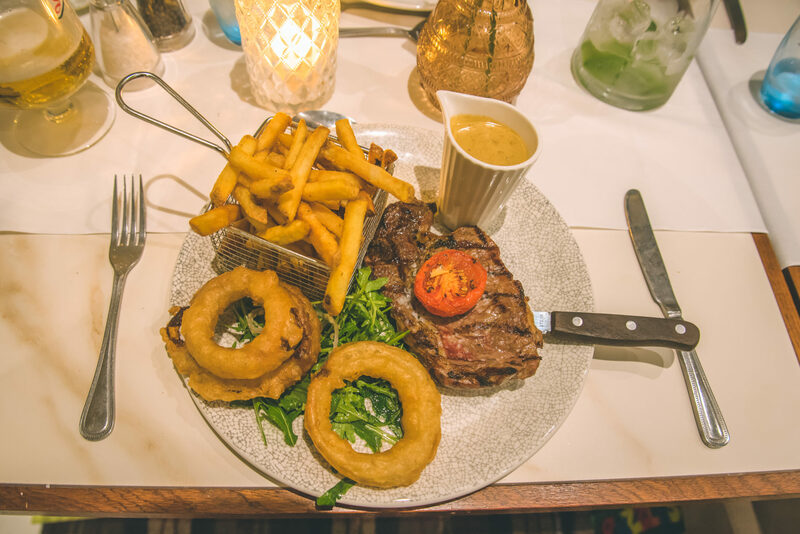 Gaz said that his steak was cooked to perfection and Lewis said his burger was “amazing” which is high praise from a soon to be fifteen year old who usually mumbles or grunts his appreciation. The children all went for a roast chicken dinner which I was really impressed with. The portions were really big and there was a lot of vegetables included, some they ate and some they didn’t! I think we were all very full after our starters and mains and yet when the waiter returned to ask if we would like to order from the dessert menu, it was just too good to turn down! Although true to form, Harry went for his usual choice of ice cream! 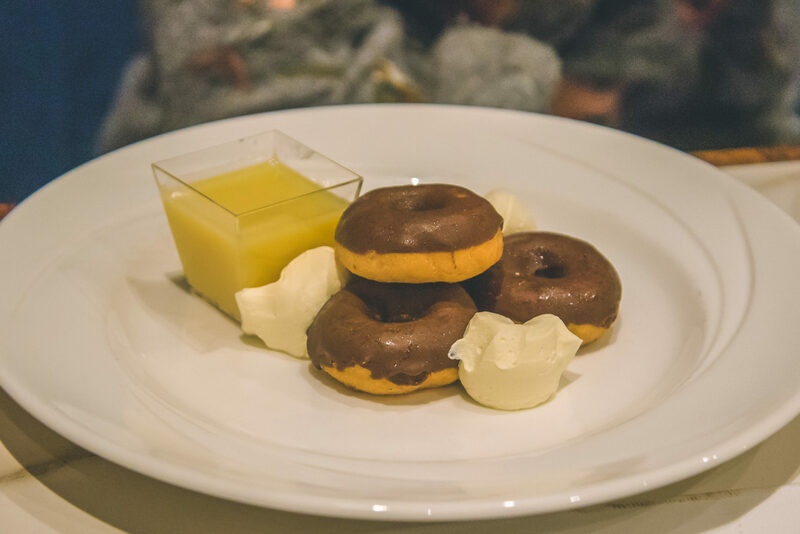 Megan chose the mini chocolate glazed donuts with a white chocolate dip which looked delicious and again came as a really big portion. 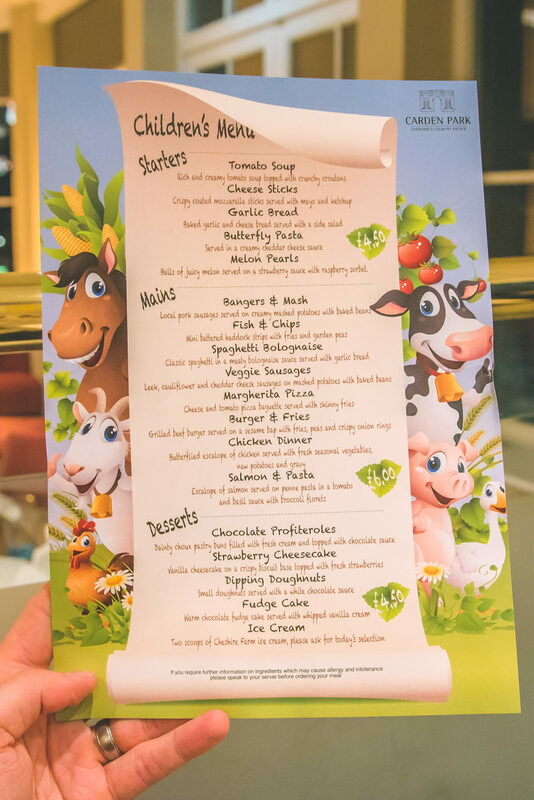 For smaller children the children’s menu could even be split between them I’m sure! 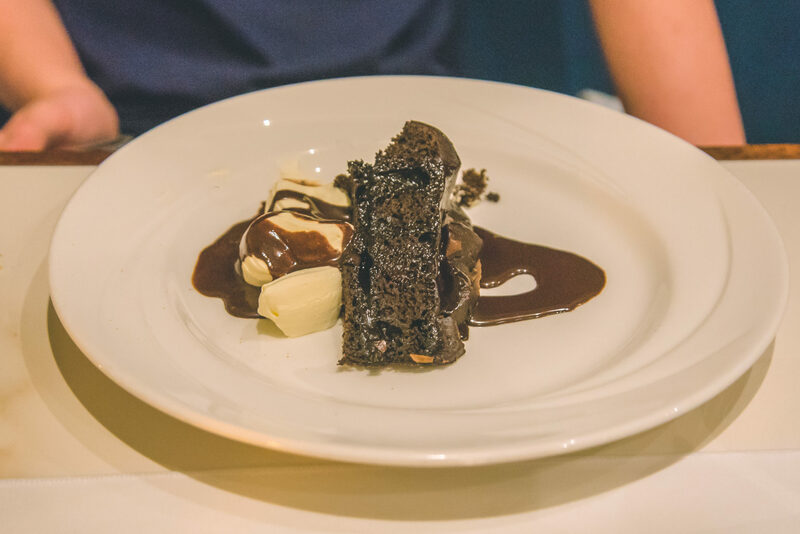 The portions were so large that Lewis actually ordered his dessert from the children’s menu and he and Eva both had chocolate fudge cake and ice cream. You can’t beat a hot, gooey, hot chocolate fudge and, with the ice cream from the Cheshire Ice Cream Farm, it looked so yummy! 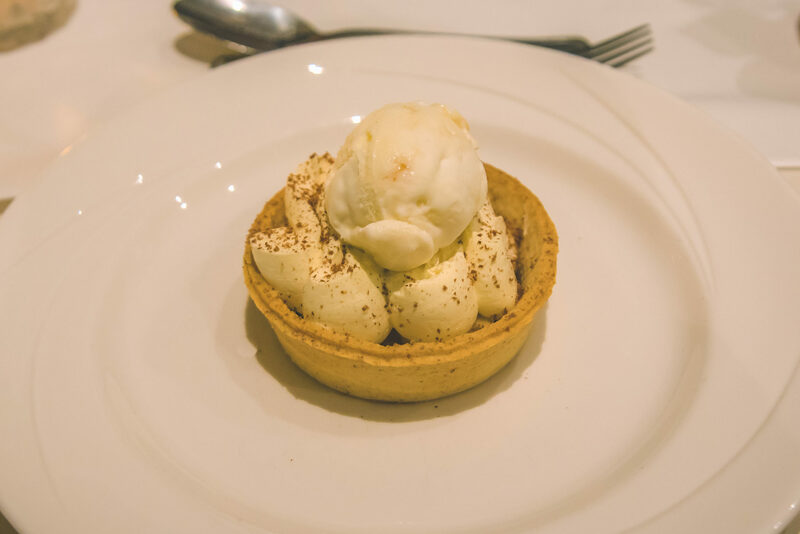 Gaz’s dessert looked amazing – banoffee pie and honeycomb ice cream, and I have to admit I felt a pang of jealousy at being gluten free. With fresh cream and chocolate shavings, and a yummy banana and toffee filling, it really did look good! 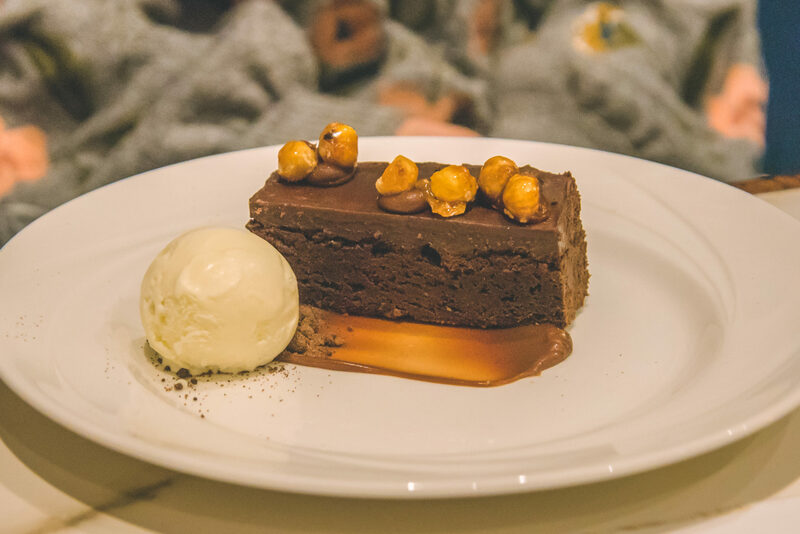 That said, my dessert was the biggest chocolate brownie topped with caramelised hazel nuts and finished with vanilla ice cream. I don’t often let my food defeat me but I did have to pass the last few mouthfuls over to Gaz! Our meal was absolutely delicious and I couldn’t fault it for both quality and service. 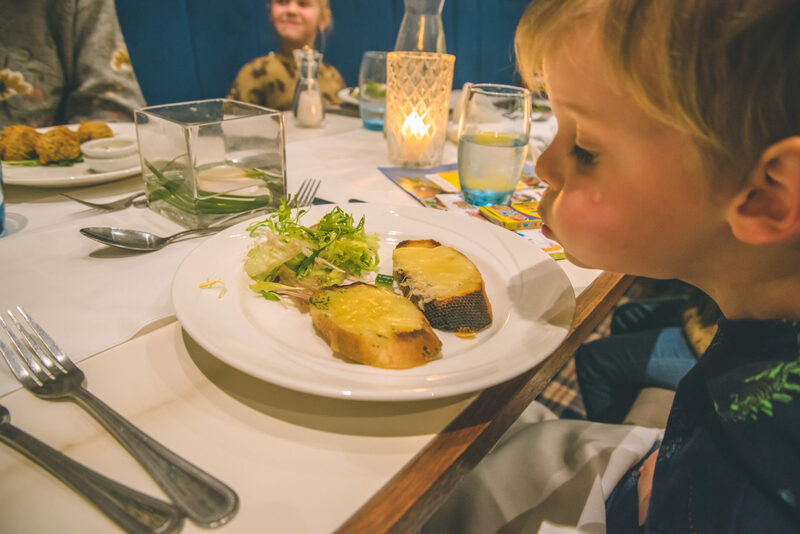 It made such a huge difference to us that families are so welcome here and I didn’t have to shush the children or feel uncomfortable when they knocked cutlery onto the floor (even for the third time). It was one of the most relaxing and delicious meals we’ve had in such a long time. When we got back to our room we were all exhausted and collapsed onto our beds to enjoy a little peace before bed. 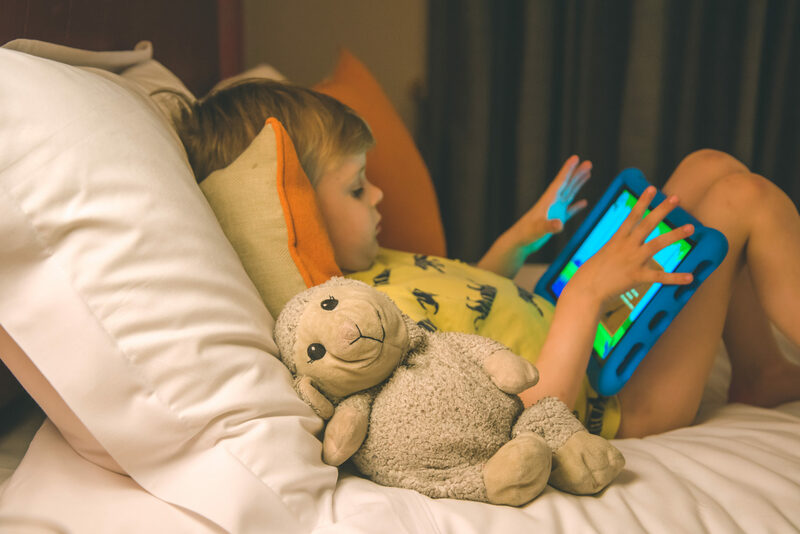 The children thought it was the best day ever that they could watch a little of their iPads in bed, and Gaz and I enjoyed the chance to watch a film before falling asleep. 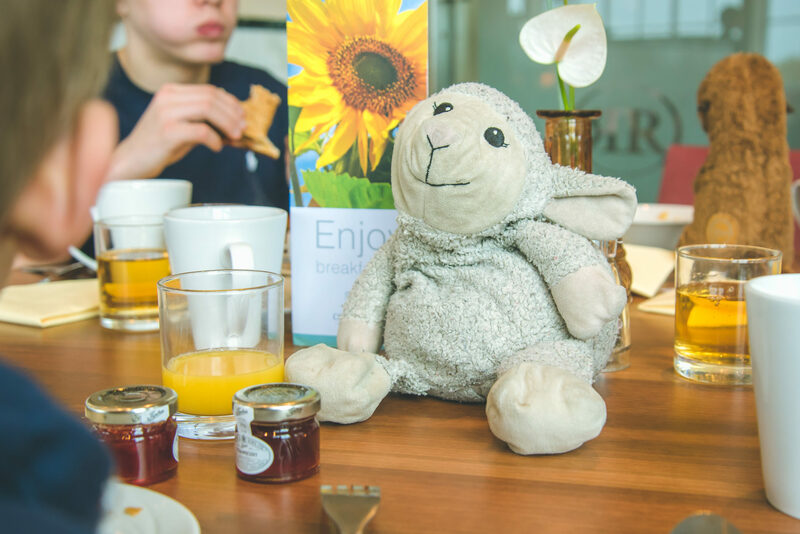 After a good nights sleep we all woke ready for breakfast which is probably one of my favourite things about staying in a hotel. As much as I love a full English, I never make one at home. 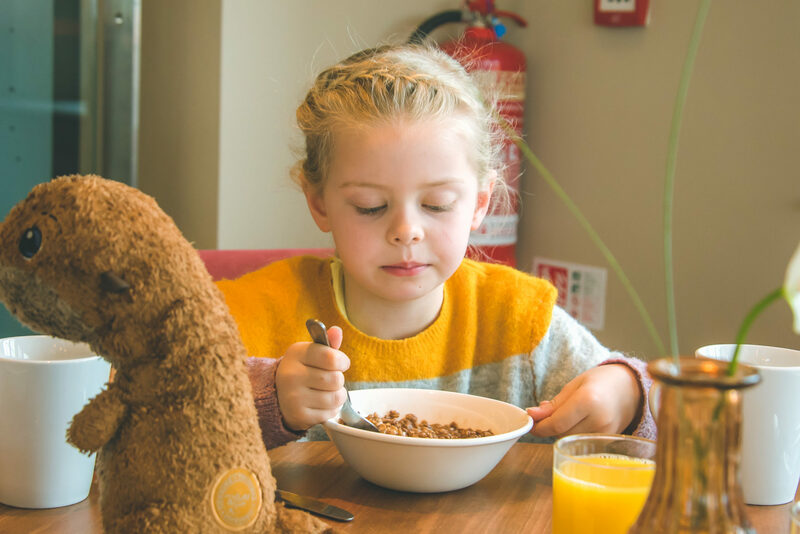 I think everything tastes a lot better when you don’t have to cook it and clean up afterwards, so when it comes to a hotel breakfast we always tuck in! 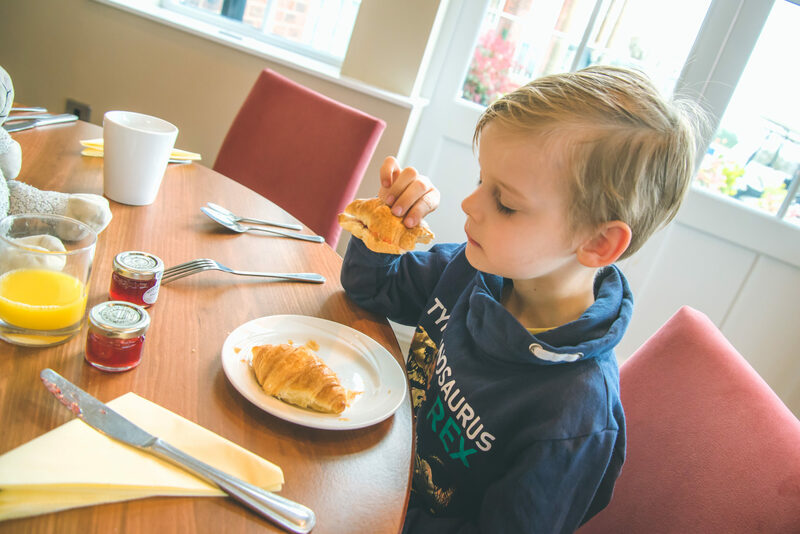 With a huge selection of continental breakfast items, as well as a hot breakfast buffet, the children filled up on cereal and croissants. 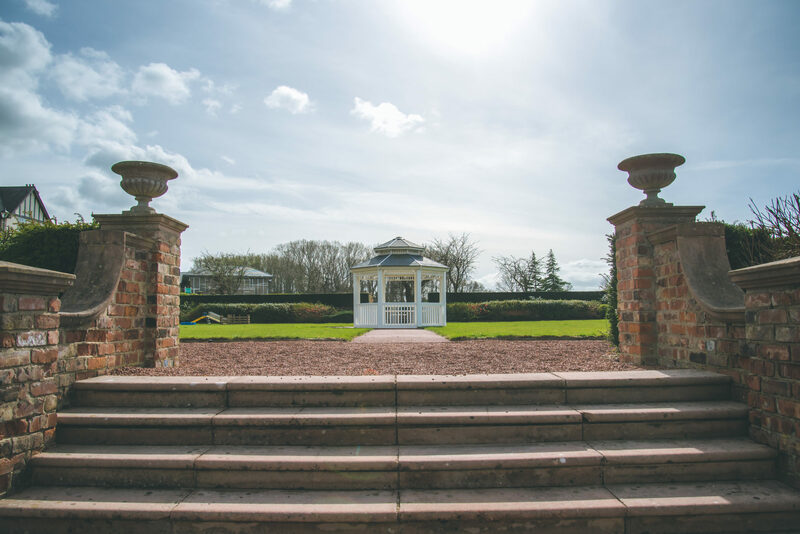 With views out across the gardens and the golf course, and the sun pouring in, it was the perfect way to start our day. The hot breakfast was really tasty as well as being nice and warm which is the main thing for me. 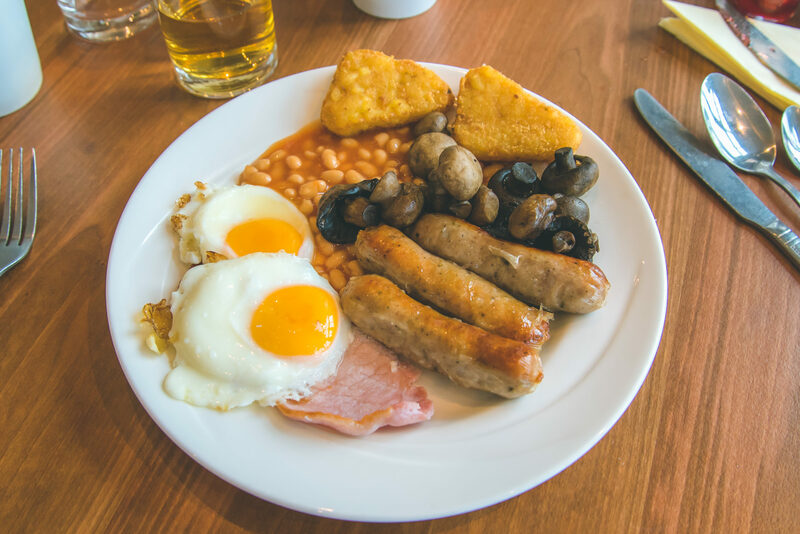 As with the meal the previous night, the food is of such a high quality and Gaz and I couldn’t get over just how big and tasty the yolks were in the eggs – so good that I had three! 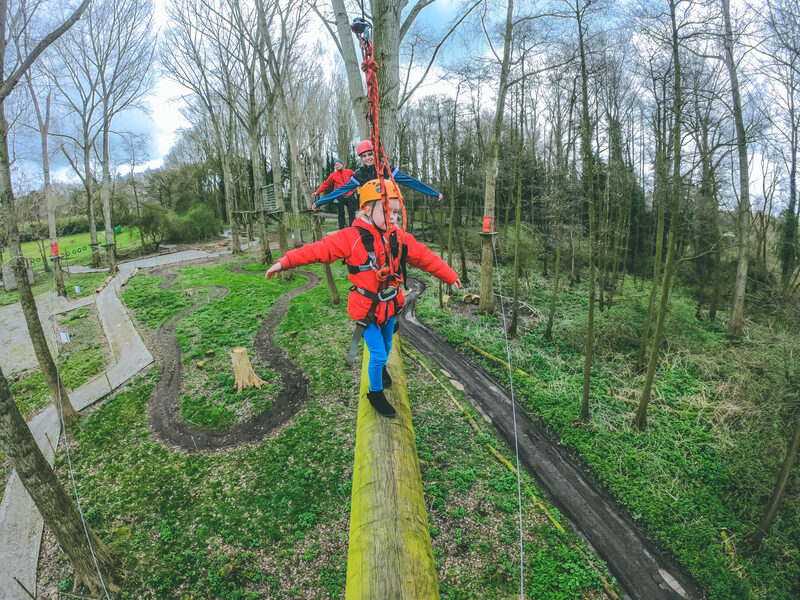 After breakfast we couldn’t wait to enjoy some of the many activities which Carden Park offers. 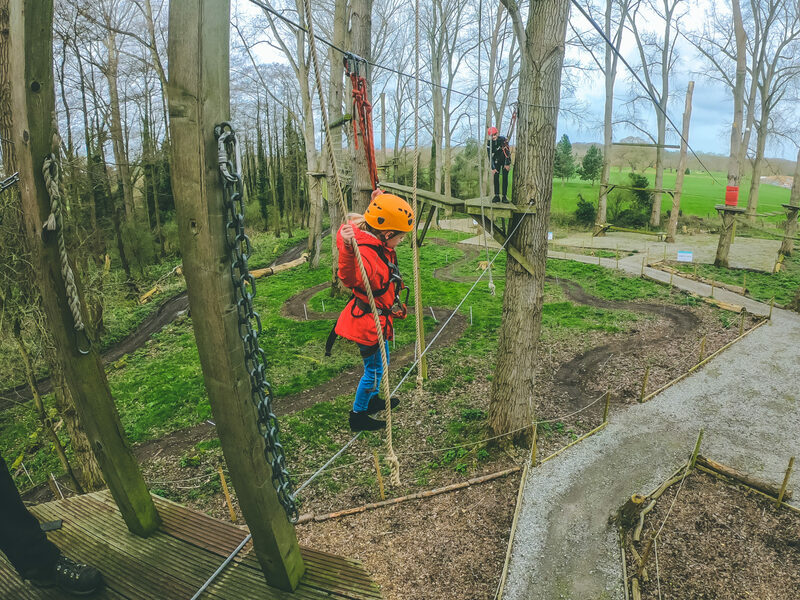 With an amazing activity centre where you can enjoy high ropes, quad biking, archery, table tennis, and many more activities, you could spend an entire week at the hotel and still leave without doing everything! 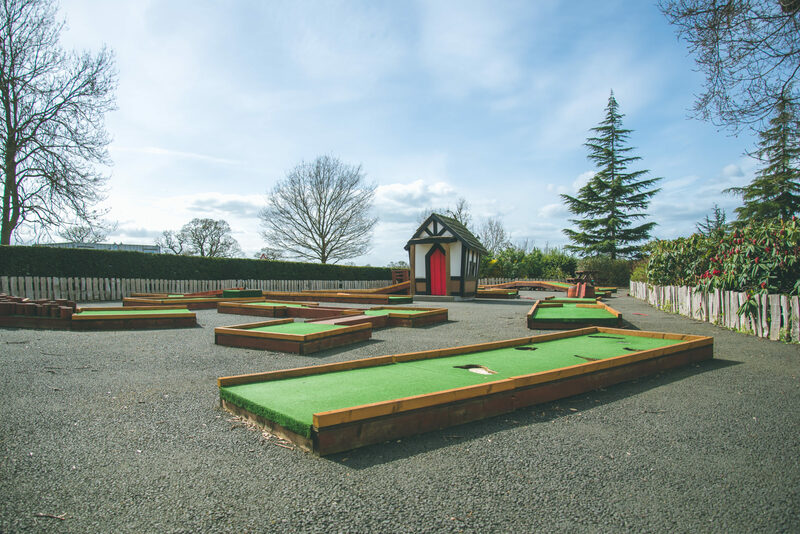 While Lewis, Gaz and Eva tackled the high ropes, Harry, Megan and I enjoyed a game of crazy golf and outdoor chess and draughts – not that they had the slightest clue how to play! 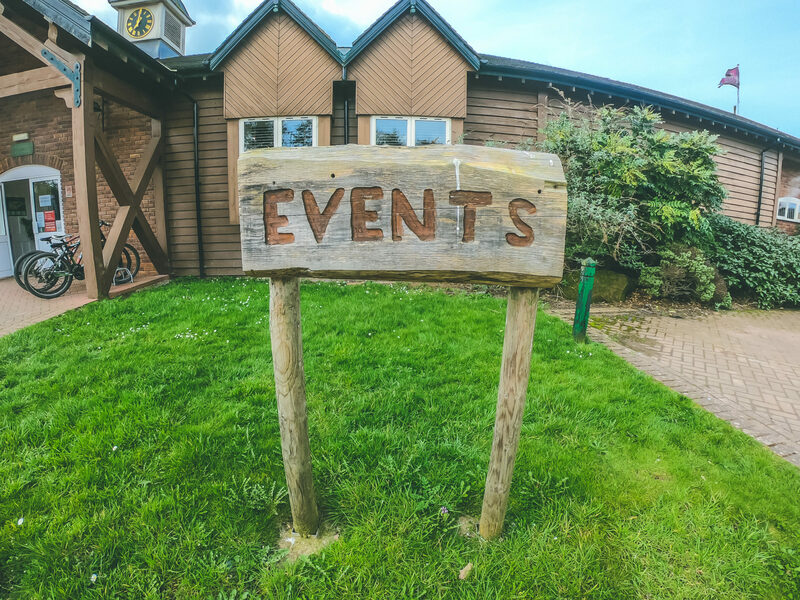 The outdoor games area is such a lovely idea and great for smaller children who aren’t quite old enough to do the activities at the events centre. 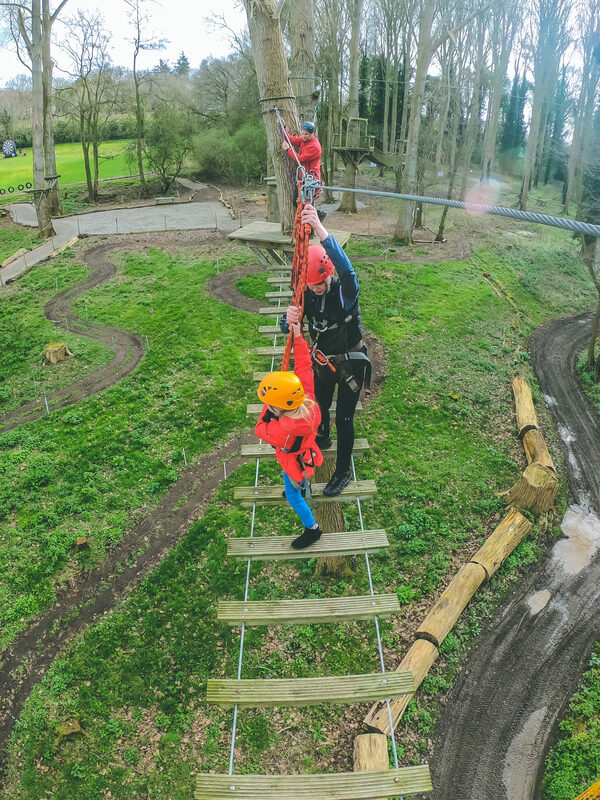 By the time we had finished our game we walked back over to the high ropes to watch Gaz, Eva and Lewis up in the tree tops, and I was amazed at how brave Eva was being at just seven years old! 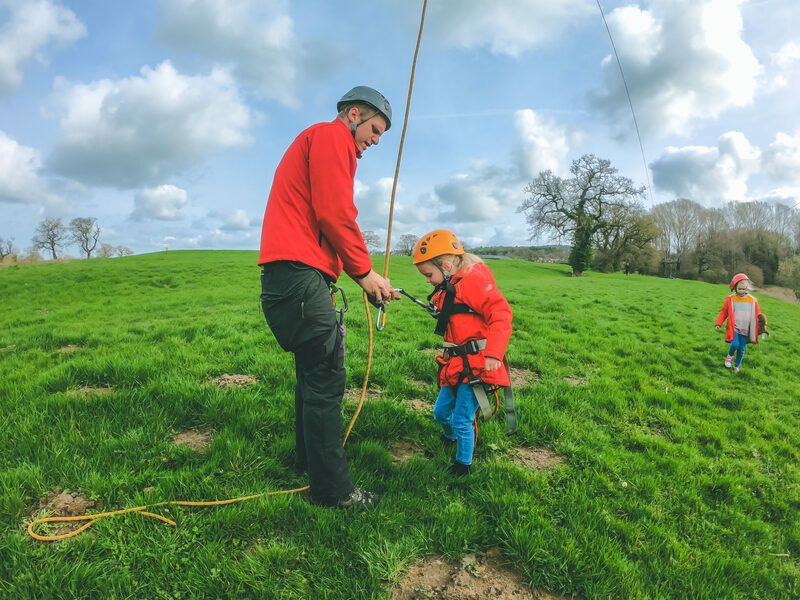 The high ropes are around 50 feet in places and I got quite emotional watching Eva up there, her little face fixed with determination, doing something which to be honest, would have terrified me at my age, let alone at seven! Watching from the ground I was so impressed that a member of staff helped Gaz in getting Eva around the course safely. 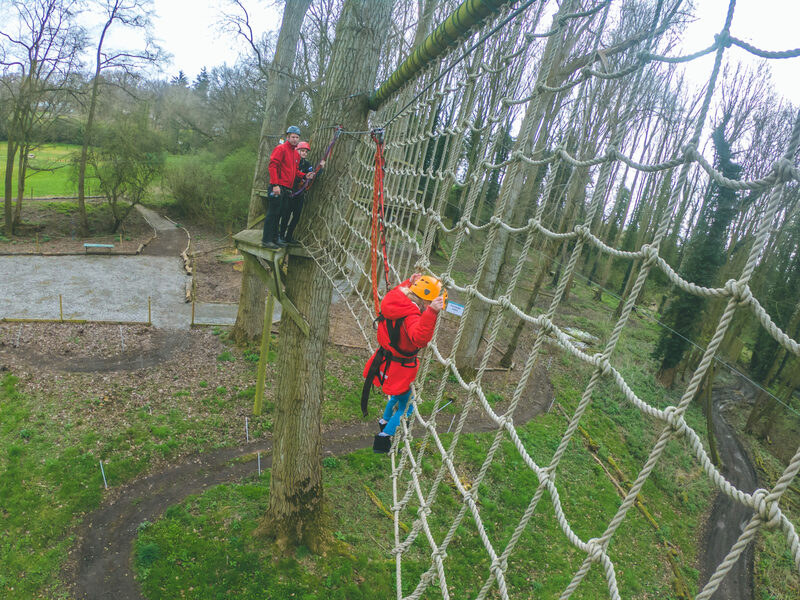 With each person having to clip themselves on and off the safety ropes, it was reassuring to see that there was an adult with Eva at all times. After the excitement of the high ropes it was time to wind down in the spa, and we were all excited about a dip in the pool and a relaxing soak it the jacuzzi. 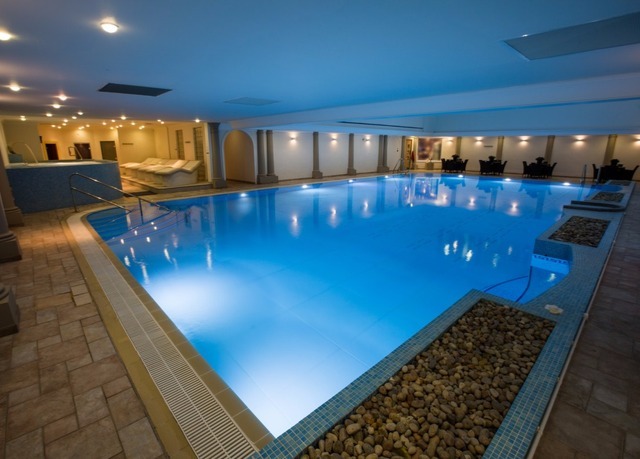 The spa is gorgeous, and has a real air of luxury around it in keeping with the general feel of the hotel. 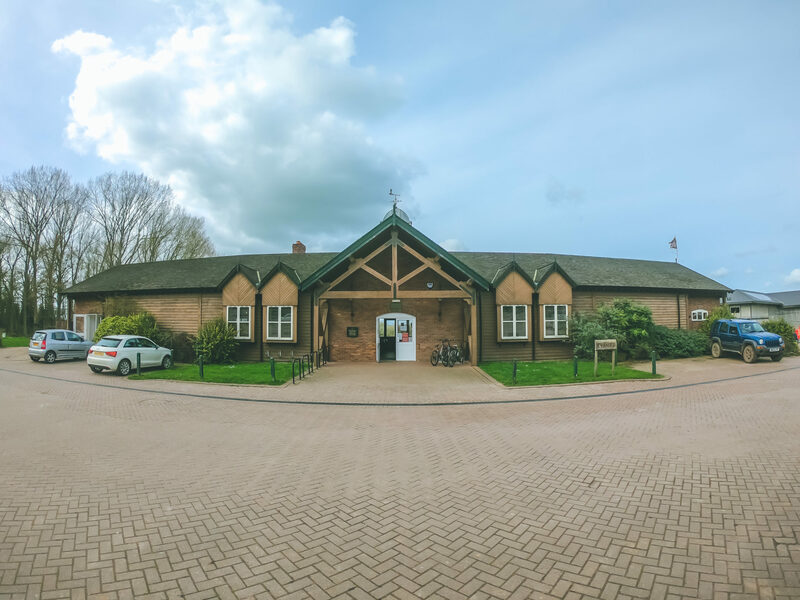 With loungers to kick back on, a pool, jacuzzi, sauna and steam rooms, as well as treatment rooms for those wanting a pamper, it was just what we needed before returning back home. Even on a Saturday, although the pool was busy, it didn’t feel overly crowded, and I loved that the pool was nice and warm for the children, as well as the changing and shower facilities being immaculately clean. 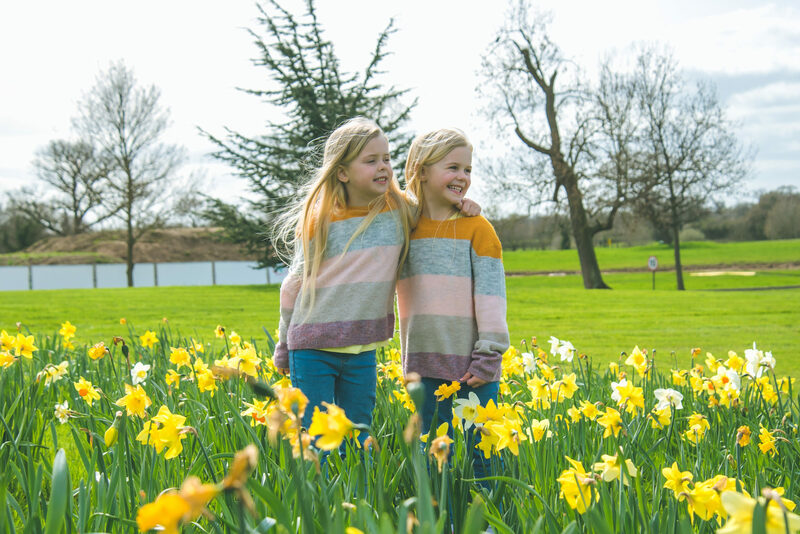 Before heading home we enjoyed a walk around the gardens, enjoying the scenery and the sunshine, and of course, taking the opportunity to get some photos of the children together which is a rarity. 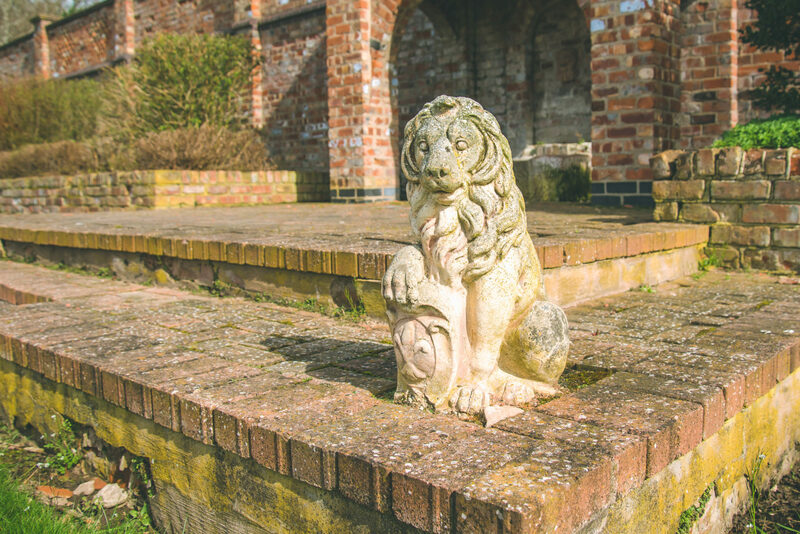 The gardens at Carden Park are stunning, and the amount of upkeep that goes into them is admirable. With spring flowers blooming, and blue skies at last, I couldn’t help but imagine how lovely it would be to get married there with all of that greenery as a backdrop. We were lucky to just catch the dog training in the gardens at the front which the children thought was amazing! 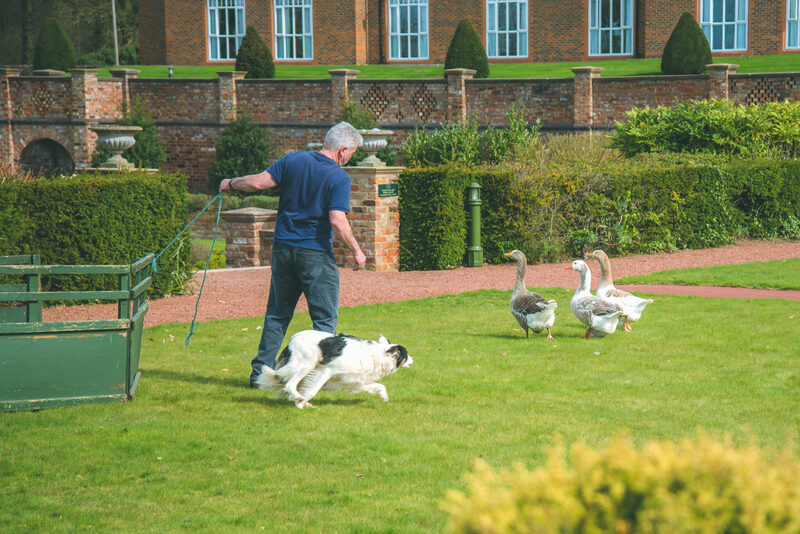 Seeing the young dogs round up geese into their pens was really impressive and I love how versatile Carden Park is for not just hotel stays, but for a wider range of uses. 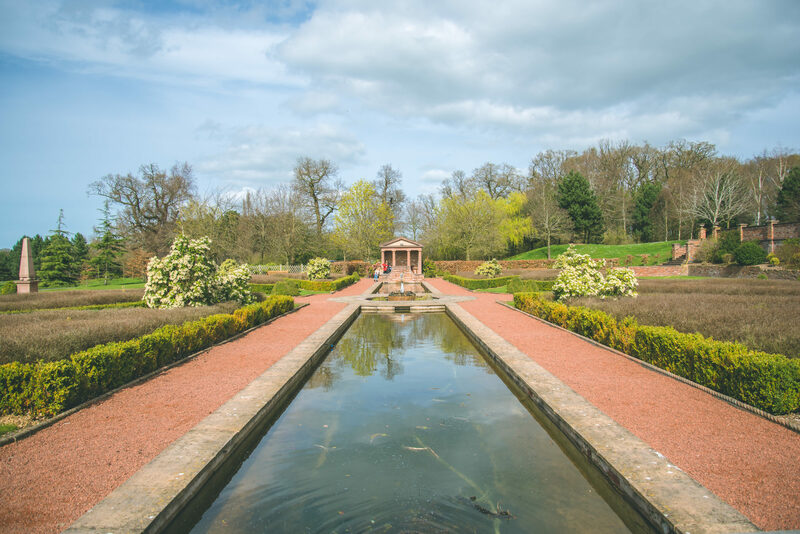 With stunning water features, statues, a band stand, and so many different areas, we could have wandered throughout the gardens all day long. 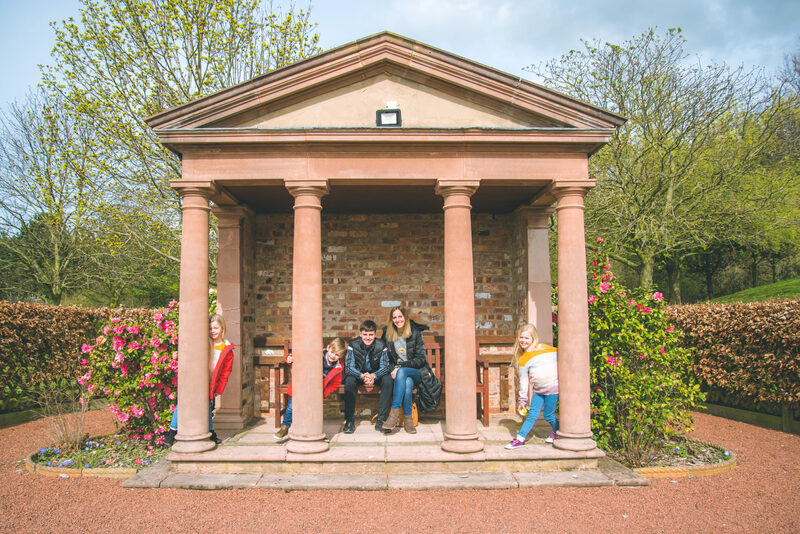 Despite being so close to the city of Chester, it really does feel as though you are in the depths of the countryside and even with our noisy children, the surroundings are just so peaceful. As we got in the car to leave, both Gaz and I agreed that it was our favourite family hotel we have stayed at so far. 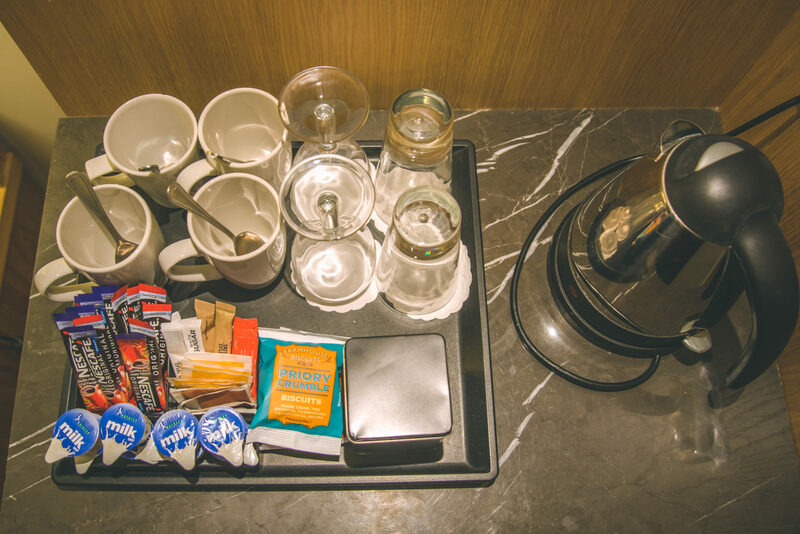 The thing we loved the most was that you still have the luxury of a four star hotel, with beautiful interiors, delicious, food, and incredible facilities, but without any of the “stuffiness” that you often find at hotels of this nature. 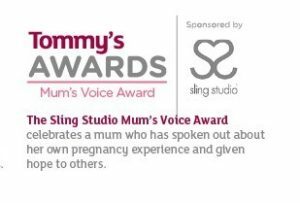 And as parents who still want to enjoy travelling and staying in beautiful hotels, all whilst raising a family, we couldn’t ask for more than that. 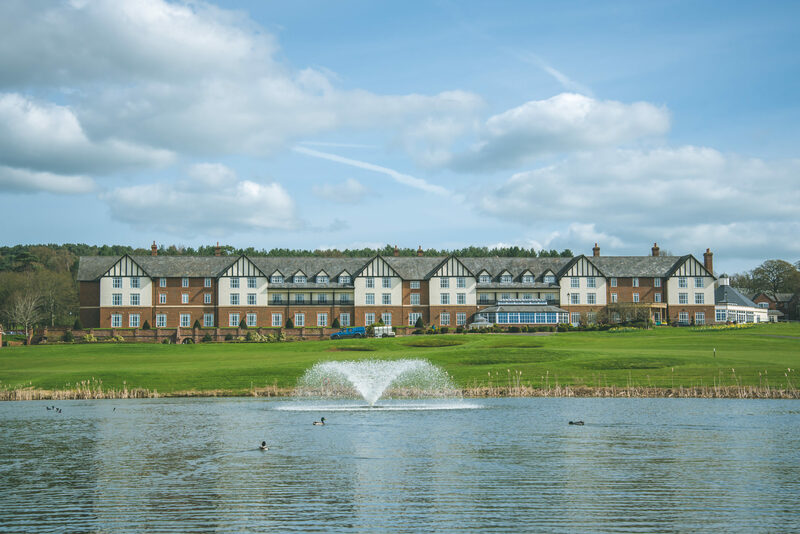 For anyone looking for a family stay in the Cheshire area, we can’t recommend Carden Park enough. 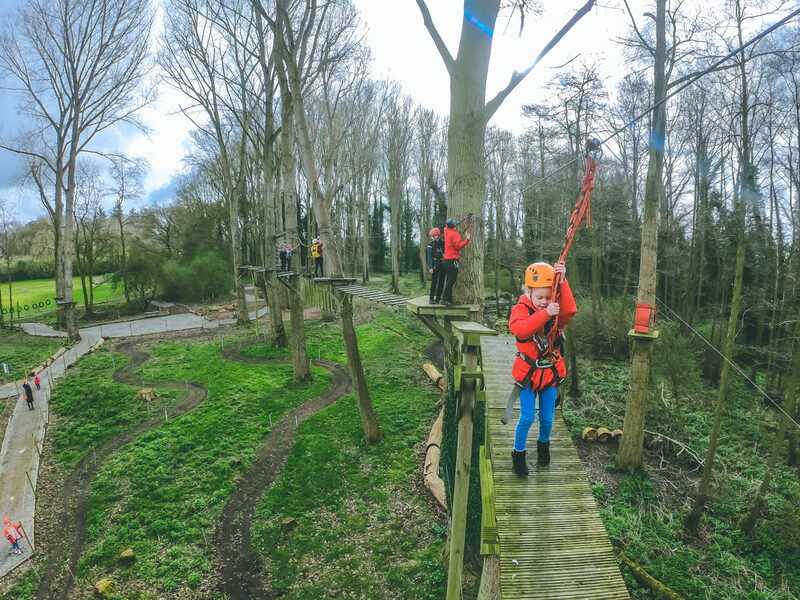 My only regret is that we couldn’t stay for longer although I know without a doubt we will be back again….and next time maybe you’ll get me on the high ropes! What a fantastic experience you had. 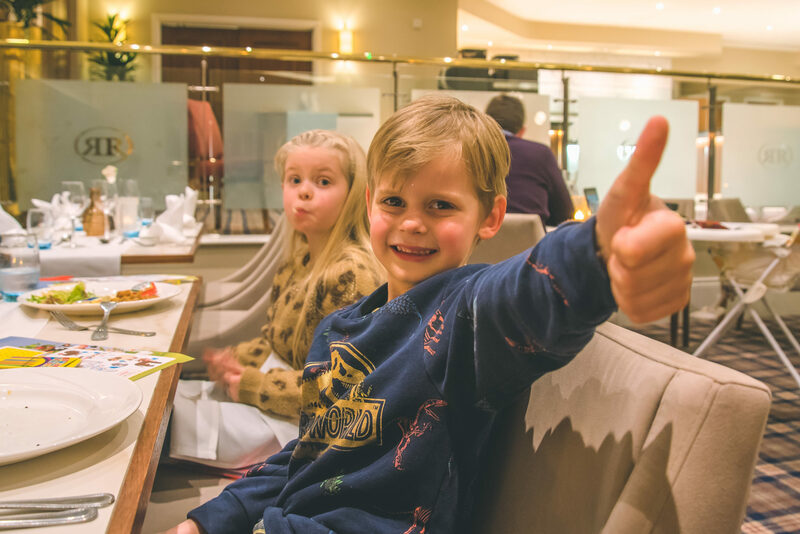 The swimming pool looks amazing with those columns and it looks like you enjoyed the food – it even got a thumbs up! 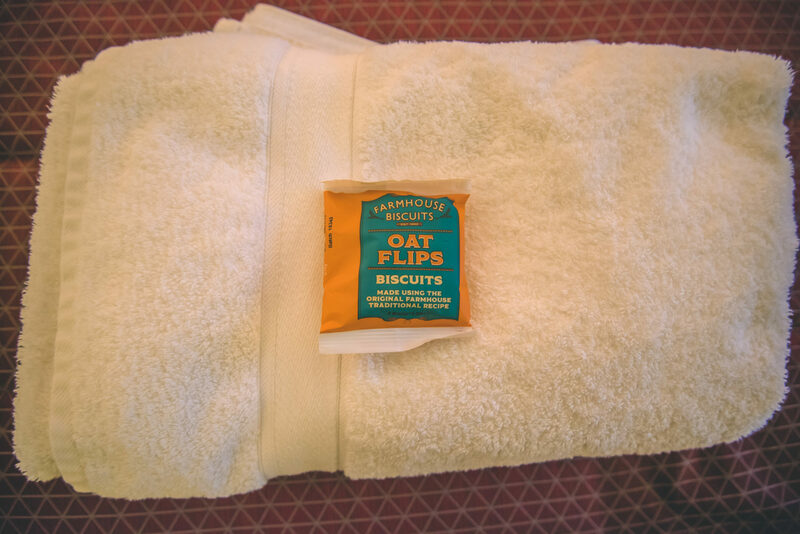 What was your favourite part of your stay? What a lovely looking place to go and spend some time. 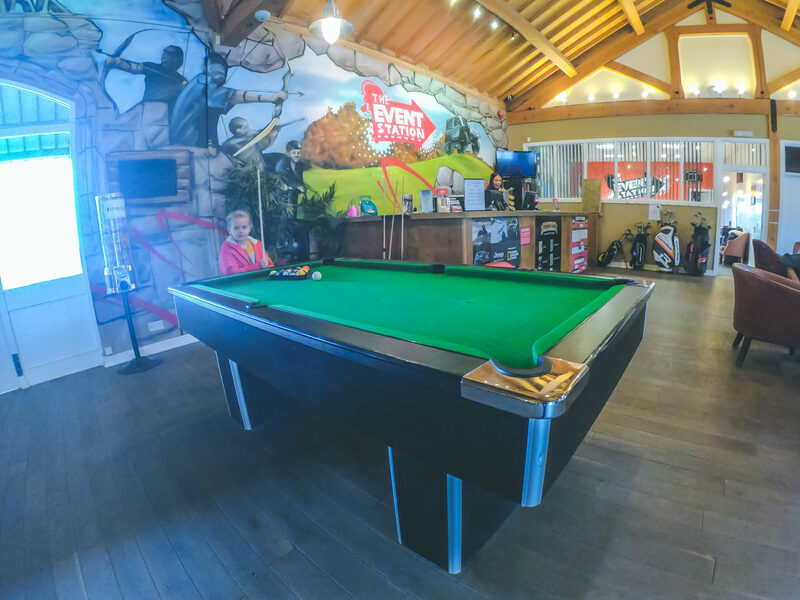 The rooms look really comfortable and feel of some little extras and the menus sound great for all of the family. Wow this looks a great place to visit. I’ve never heard of this place. This place looks so relaxing. That pool is so nice and I would be hanging out there. 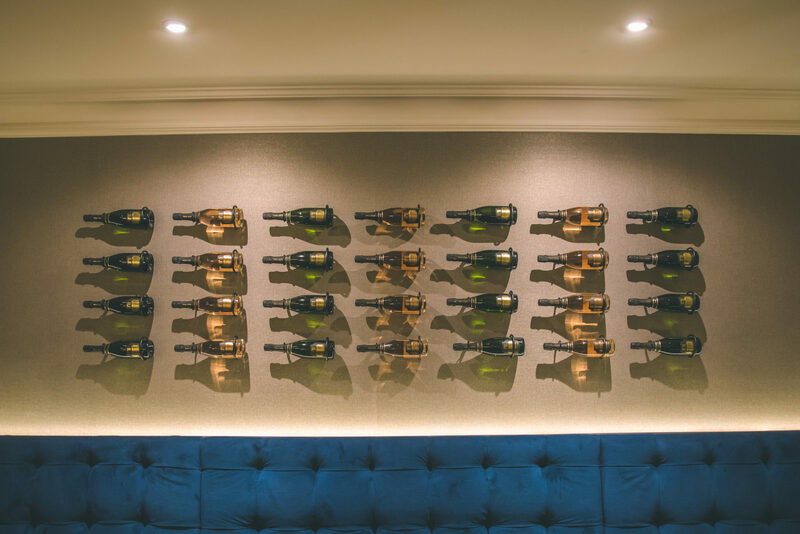 A place of class, warmth and relaxation. Where to stay, experience the joy of nature and take care of yourself! Wow the pool looks amazing and the rooms are gorgeous! I love how unique and bright the children’s menus were as well. 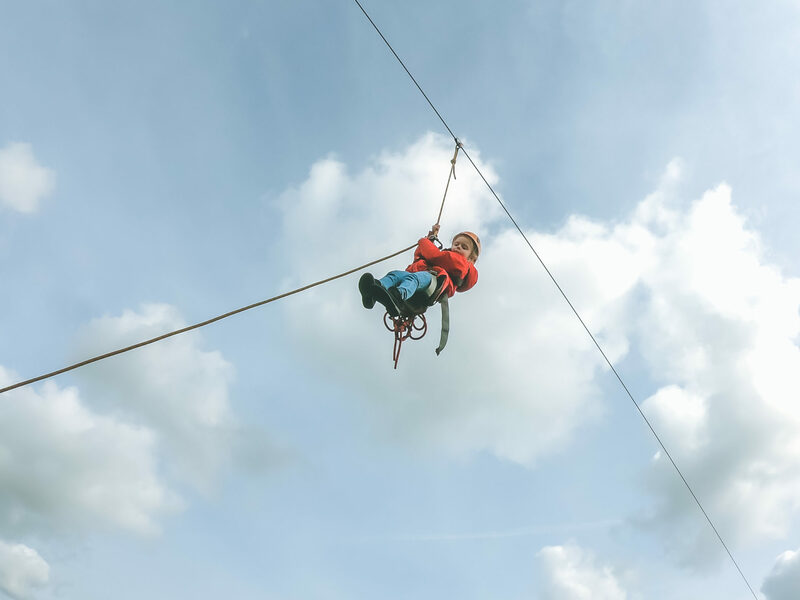 your photos are amazing.. those desserts look totally drool-worthy; and i had the same feelings you mention when my daughter was doing a similar high rope course a couple years ago.. This looks like the ideal place for a family stay. Your rooms were so spacious and the purple tones are very warming. You wouldn’t have got me on the High stopes either! Wow, this looks amazing. So lovely when there’s such nice little touches to the room (I’m also always relieved when there’s a bath in the room for Jasmine). 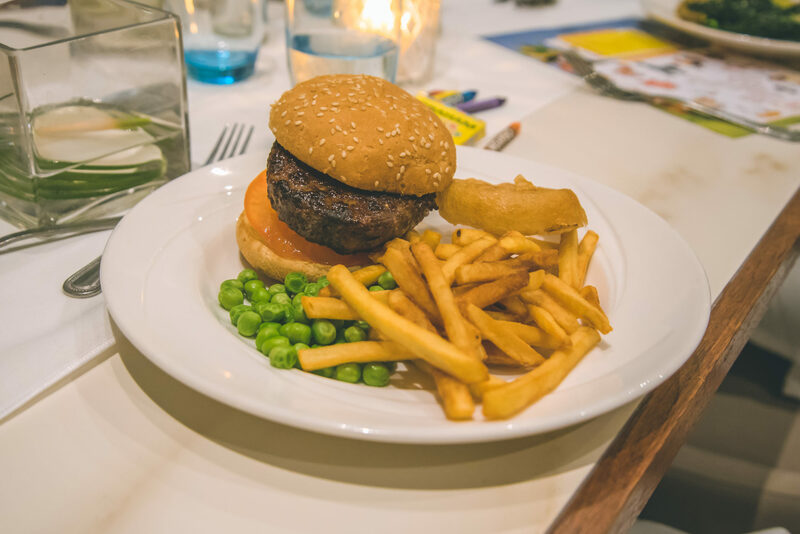 The food looks amazing, great to see such a good choice for children too! First off I want to say that your large photos are incredible. They really make me feel like I’m there in person. Next, I have to just say that if I’m ever in the area, I really want to check out this place. It looks like my kind of hotel and the whole place makes me feel right at home even though I’ve only witnessed it in photos. The rooms in the hotel are so spacious and clean! I love the purple and gold decor as well. Thanks for the info! Oh Wow! 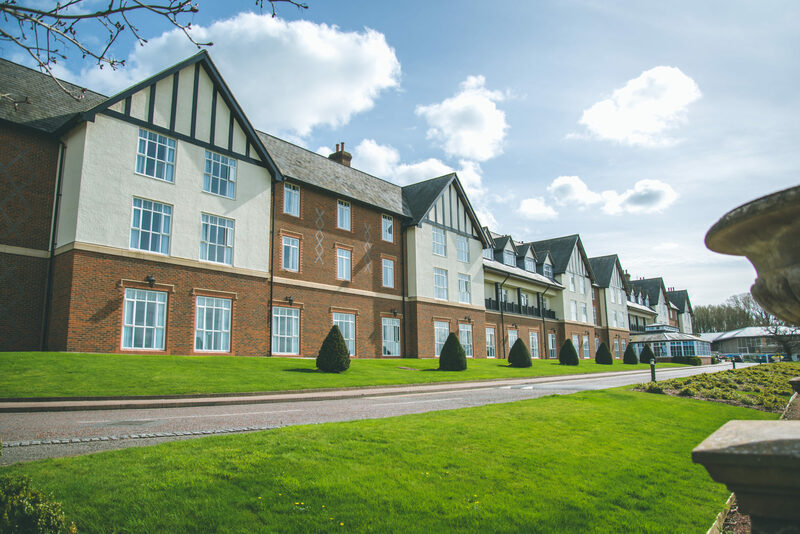 Carden park hotel looks like an incredible place to stay. It definitely looks like you had more than enough activities to keep everyone happy throughout the trip! I really like the sound of this hotel in Cheshire. Will be checking it out for when we need it. The food looks so good! I am happy to know that even the kid’s menu offers tasty dishes any child would love. 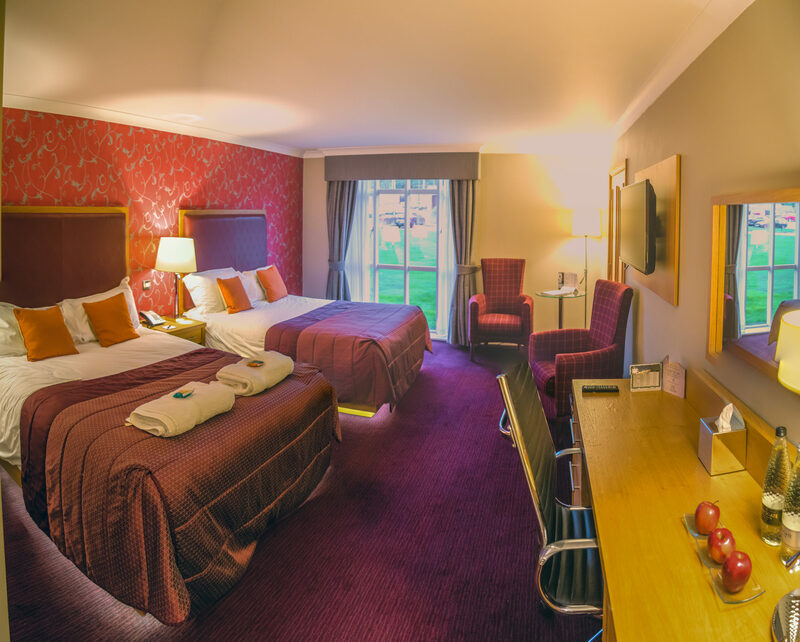 Th rooms are spacious and the beds look really comfy! 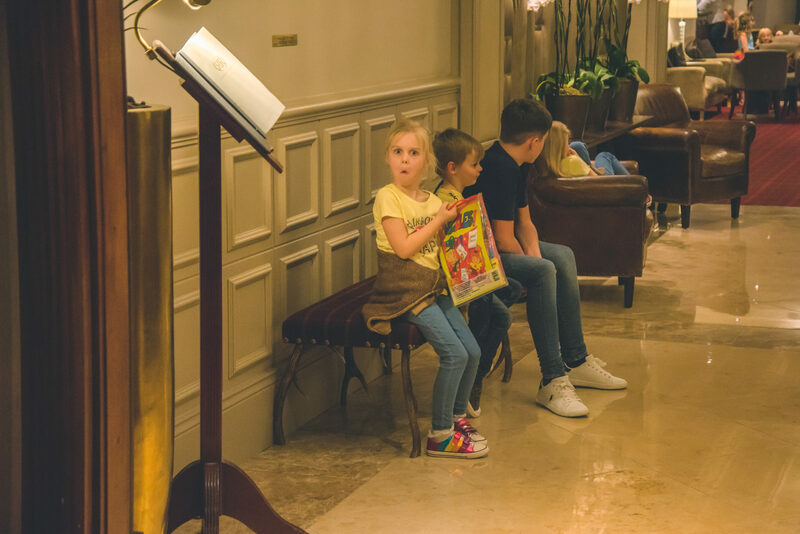 This is a truly family friendly hotel! 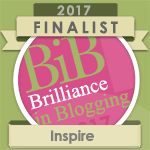 Gosh, that looks incredible! 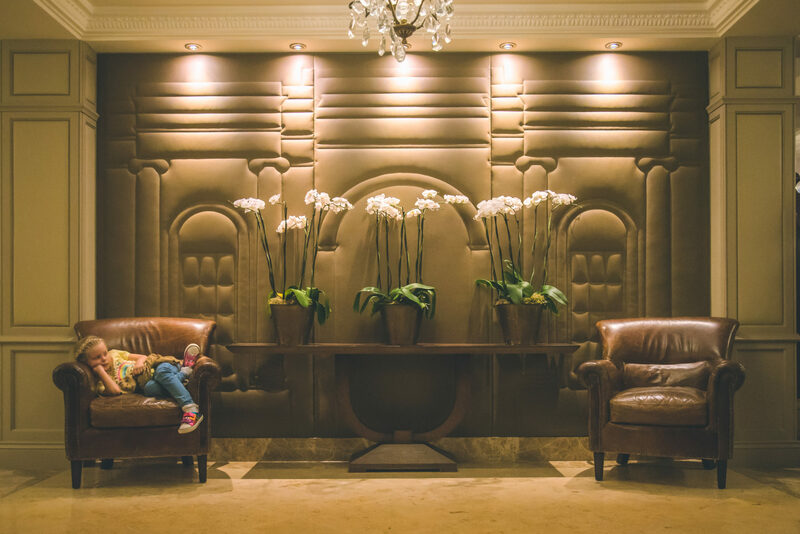 It’s lovely when you find a real family-friendly hotel. Looks like you all had a thoroughly enjoyable time. 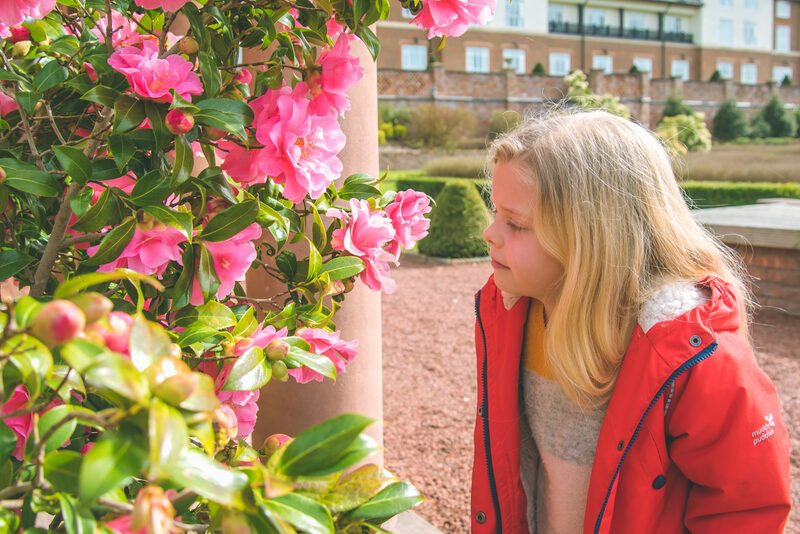 It looks like a gorgeous place, I’m always looking for child friendly places to visit now that my daughter is getting older and keen to do more trips. 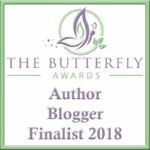 Great review, especially for me being a larger family. The food looks delicious! Wow, this beautiful place looks so luxurious. Thank you for sharing this post. Wow what an amazing experience. 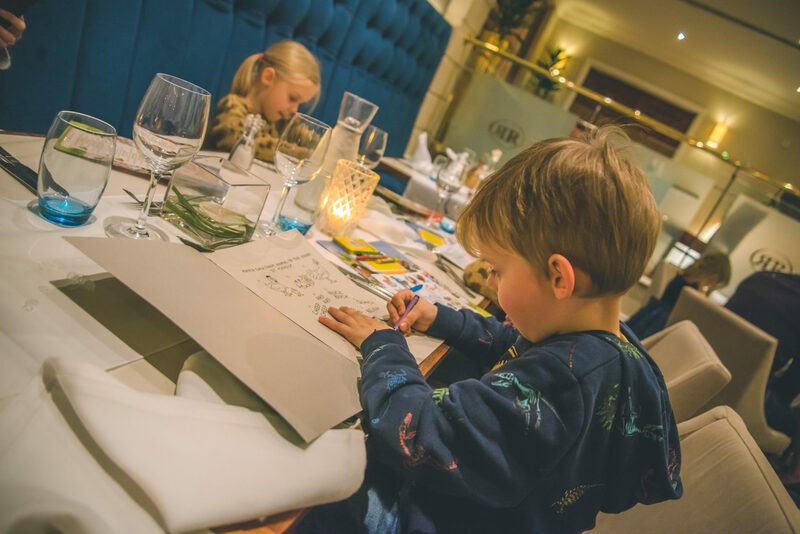 I just love how family oriented Carden park hotel is from the extensive children menu to the activities. Plus it’s aesthetically gorgeous! Wow! This place is something man. I love the blooms, exteriors, interiors and everything about this plush hotel spa. 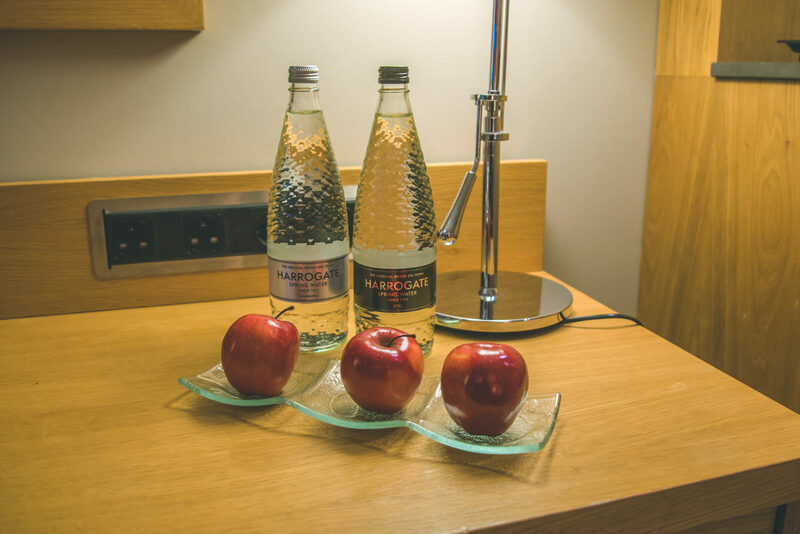 To say that the hotel and rooms are fantastic is an understatement. But what really draws my attention is those outdoor activities. My kids would love them. How I wish hotels have something like these. woah! This looks like a great place to stay. Glad to know that your kids had the great time. I love places who are detailed oriented. I agree that the small details makes the difference. That looks like a pretty enjoyable place! 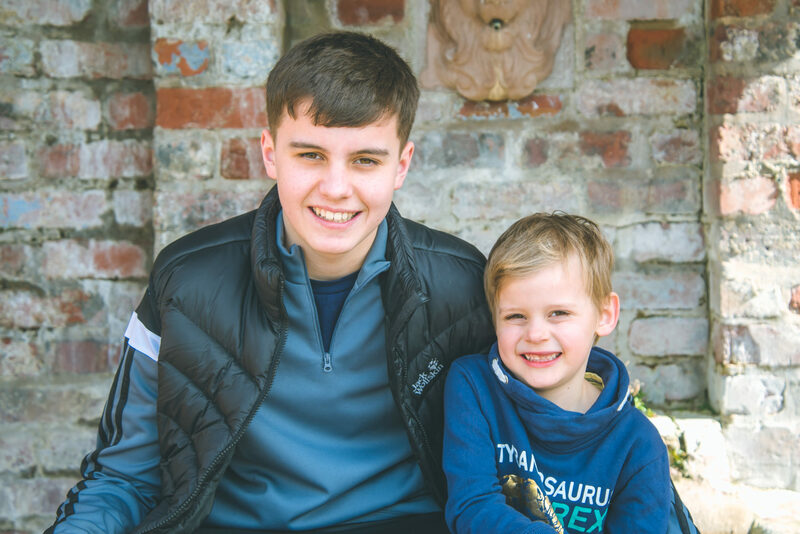 My family loves going to new places to relax! Love it! 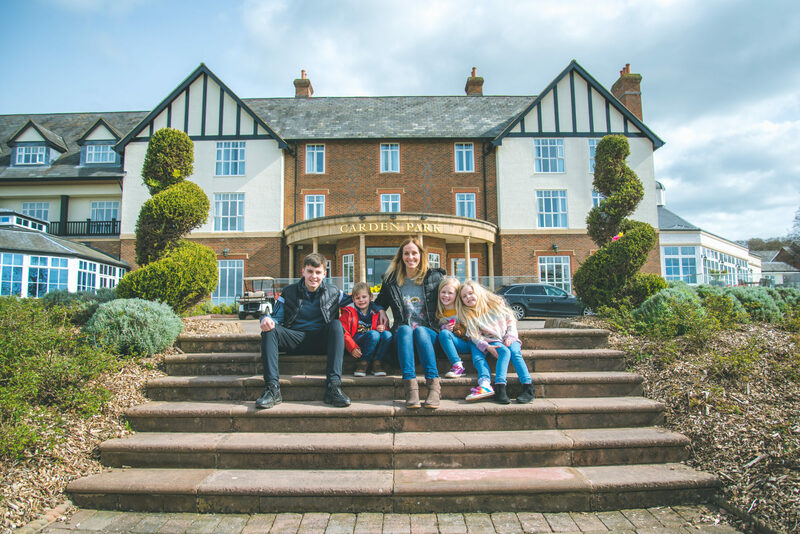 WOW what a beautiful hotel and so lovely that families and young children are all made to feel welcome, its definitely something I worry about when thinking of booking somewhere as a family! Everything looks so luxurious and the food all looks absolutely delicious! I know my two would really love the outdoor adventures in the tree tops too! This is such a beautiful place to visit. I think it will be perfect trying this with friends and family members. It is laid back and relaxed. This is a gorgeous hotel, and your rooms were really nice! Love that it’s so kid friendly! 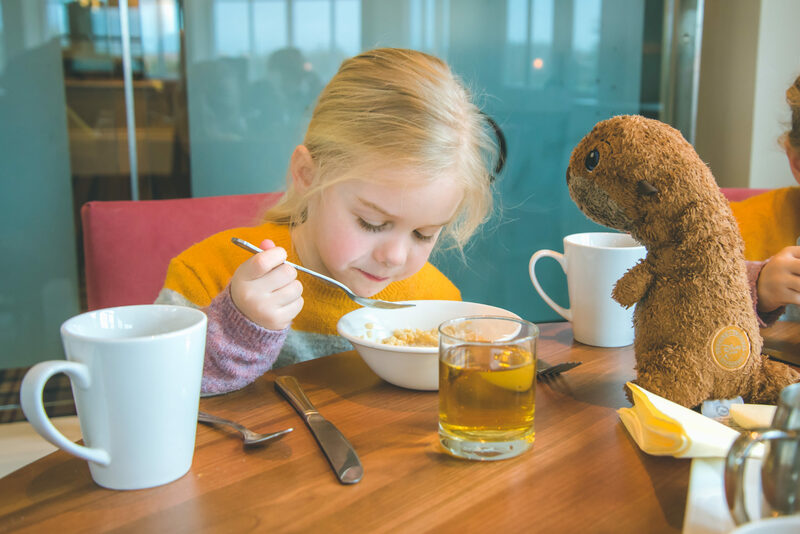 It makes traveling with family so much easier when the food is good and there is plenty to do! I was also thinking the same way as you. It is so wonderful to have a wedding at this place. Everything looks stunning. Wow this pace looks absolutely amazing. It looks so comfortable and perfect for families. I love the amount of outdoor activities that they have as well!